Using recycled milk containers as the primary source of plastic for all of their toys, Green Toys are true eco-friendly products. The big green Recycling Truck toy is the perfect embodiment of all these eco values. Learning through play, kids have such fun sorting bottles, paper or cans through the slots in the side of this super vehicle. Distributed in the UK by Bigjigs, the Recycling Truck also incorporates a moveable recycling bed as well as an opening and closing rear door. The amazing eco-design also has no metal axles. Tough, good looking and well made, other toys in this range also include a Dumper Truck, Fire Truck and a Flat Bed Truck with Racing Car. 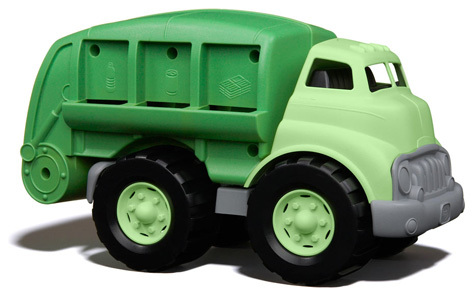 Please tell us what you think of the Green Toys Recycling Truck by Bigjigs.